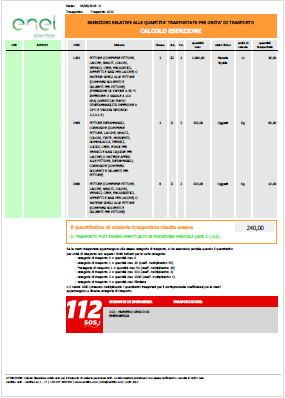 Whith ADR 2019, in the case of intended application of 1.1.3.6, the total quantity and the calculated value of dangerous goods for each transport category shall be indicated in the transport document in accordance with 1.1.3.6.3 and 1.1.3.6.4. In Certifico ADR Manager available function “calculated value” of DG whit Report, see example Report Calculated value what can be attachment in the transport document. NOTE 1 In the case of intended application of 1.1.3.6, the total quantity and the calculated value of dangerous goods for each transport category shall be indicated in the transport document in accordance with 1.1.3.6.3 and 1.1.3.6.4. (a) For UN Nos. 0081, 0082, 0084, 0241, 0331, 0332, 0482, 1005 and 1017, the total maximum quantity per transport unit shall be 50 kg.